Sally Anne Wilson - Edmonton's Burial & Cremation Professionals | Trinity Funeral Home Ltd. It is with great sadness that the family of Sally Anne Wilson, announces her passing. After a lengthy battle with cancer, on Friday, February 24, 2017 at the age of 77 years. Sally will be lovingly remembered and sadly missed by her children Dusty (Donna), Donald and Tammy (Dave – Son by Choice). Sally will also be greatly missed by her grandchildren Candice (Dustin), Chantelle (Shaun), Dalton and Coralee. Great-Grandchildren Mikayla, Cole, Hayden and Gray. By her sister Patsy and brother Andy (Margaret). 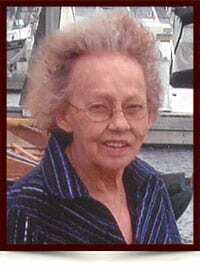 Sally was predeased by her parents James and Ellen Wilson, her husband Don, sister Nancy and Grandson Dustin. My condolences to the whole family. I pray especially for Chantelle, Dalton, Coralee and little Gray, that they will have peace with her passing and that she will live on in their memories. Will always remember Aunt Sally with fond memories. She was a strong woman. good memories will shine thru.